Our traditionally stylized Soaring Heart Whirligig is a popular vane sculpture piece for celebrating weddings and anniversaries in addition to Valentine’s Day. 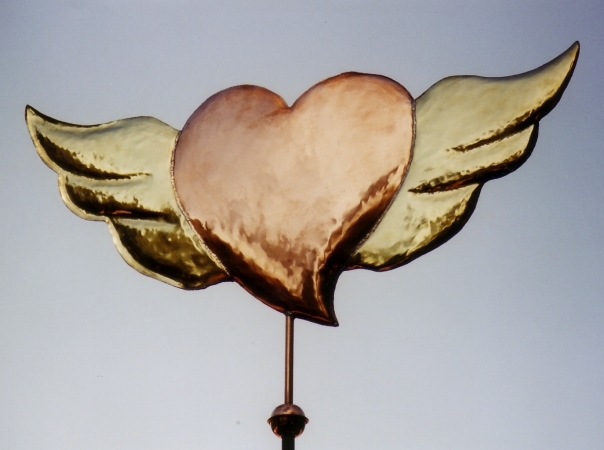 As pictured here the sculpture piece is crafted of copper sheet, in swell-bodied style, and the wings have been brightened by the optional application of gold leaf, creating a bright sight on this spinning heart for many decades as the copper weathers and patinas. This soaring heart design would also be suited to our silhouette style, and brass wings, for an economical alternative. There is a good luck tradition, that started during the Victorian Age, of placing a copper penny inside a weather vane. The ‘lucky penny’ traditionally sealed in is from the year it was made, establishing provenance. If you are ever lucky enough to find an old copper weather vane that has a metallic rattle, it is possible it has a penny inside it that was put there over one hundred years ago as part of this good luck tradition. Because we make each weather vane to individual order, we have adopted this level headed dating tradition with an intimate variation of our own. In addition to putting in a penny from the year of construction, you may choose to also include pennies from years of importance in your lives. If this Soaring Heart Whirligig is being made to celebrate an anniversary, we could include a penny from the year the couple got met, married, and the current year penny. This Heart Whirligig is lovely in all sizes and works well in many locations. A small version of this Soaring Heart Whirligig looks terrific on a book shelf, a table top or a deck railing. Other options could be in a garden setting, on top of a gazebo or fence, or there is always the traditional top of your house or garage. The heart has long been used as a symbol to refer to the spiritual, emotional, moral, and, in the past, intellectual core of a human being. The heart was once widely believed to be the seat of the human soul and the word heart continues to be used poetically to refer to the soul. Stylized depictions of hearts are used as prevalent symbols representing love. Many classical philosophers and scientists, including Aristotle, considered the heart the seat of thought, reason or emotion, often rejecting the value of the brain. In European traditional art and folklore the heart symbol is drawn in a stylized shape. This shape is typically colored red, suggesting both blood and, in many cultures, passion and strong emotion. The hearts have constituted, since the 15th century, one of the red suits in most playing card decks. The shape is particularly associated with romantic love; it is often seen on St. Valentine’s Day cards, candy boxes, and similar popular culture artifacts as a symbol of romantic love.